Try our BOWLOPOLIS children’s birthday parties which feature a choice of 2 different food packages (Papa John's pizza or Hot Dogs) or a non-food package. We provide bowling, decorations, gifts and an attendant, with each package, to ensure your child has an enjoyable party. Lots of extras for kids. The Free Coupons given out at the party may not be redeemed on date of receipt. Birthday Package rates are for CHILDREN attending the bitthday party. Adults wishing to bowl will do so at the adult rate at the time of the party. *No outside foor or beverage is permitted inside the center except for cake and/or ice cream. Sundays 12:30 pm or 3:30pm. No outside food or beverage is permitted inside the center except for cake. A non-refundable $50 deposit must be paid at lest two days before the party or the party will be cancelled. 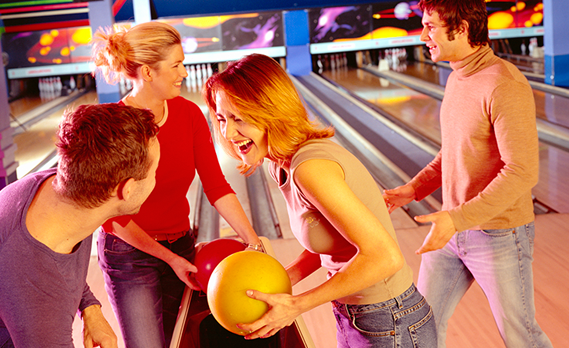 Each additional lane is $62.50 for 2 hours of unlimited bowling, 5 rental shoes and 1 pitcher of fountain drink. Call Karin Ciesiolka at (254)690-4949 or e-mail promotions@hallmarklanes.com to book your Bowling Party. 1. It's America's # 1 Fun Outing- DID YOU KNOW TWICE AS MANY PEOPLE BOWL AS PLAY GOLF. 2. You don't have to be good to have fun! 5. Great way to boost morale - almost EVERYONE CAN BOWL. 6. Planning is easy to do - give us a call and we'll do the rest. 7. Do it day or night, rain or shine. 8. Even non participants can attend and have fun. 9. We provide all the necessary equipment. 10. We have designed some FUN bowling games- you will not find them anywhere else.